WASHINGTON, DC, May 17, 2011 (ENS) – Today the U.S. Fish and Wildlife Service issued a national management plan to combat white-nose syndrome, a disease that has killed more than a million hibernating bats in eastern North America since it was discovered in caves near Albany, New York in 2006. White-nose syndrome is responsible for unprecedented mortality in hibernating bats in the northeastern United States. This previously unrecognized disease has spread very rapidly since its discovery in January 2007, and poses a threat to hibernating bats throughout North America. Since the syndrome was first documented, the Fish and Wildlife Service has been leading a national response that now includes more than 100 state and federal agencies, tribes, organizations and individuals. 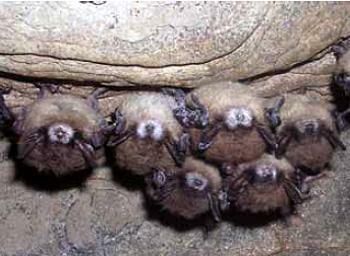 In June 2008, an effort to formalize a coordinated approach for addressing white-nose syndrome was initiated among Department of Interior, Department of Agriculture, Department of Defense, and state wildlife management agencies. More recently, a national plan steering committee was formed to ensure that Federal and State agencies coordinate and cooperate in the development and implementation of an effective national response to the disease. A product of the steering committee, the plan provides a coordinated national management strategy for investigating the cause of the syndrome and finding a means to prevent the spread of the disease. Researchers working with the U.S. Geological Survey have identified Geomyces destructans, a fungus new to science, that they believe to be the cause of the disease. The plan acknowledges uncertainty about how the disease is transmitted and exactly how it kills bats. “Although evidence indicates that skin infection by G. destructans is the plausible primary cause of mortality associated with WNS, the exact processes by which skin infection leads to death remain undetermined, and it is unclear the extent to which other conditions may contribute to susceptibility of species or individuals to fungal infection and/or mortality,” the plan states. Nevertheless, the plan outlines decontamination protocols to reduce the transmission of the fungus, surveillance strategies, and technical white-nose syndrome diagnostic procedures. “This national plan provides a road map for federal, state, and tribal agencies and scientific researchers to follow and will facilitate sharing of resources and information to more efficiently address the threat,” Salazar said. The plan’s release coincides with the fourth annual White-nose Syndrome Symposium that opened in Little Rock, Arkansas today. More than 170 of the world’s top scientific experts on bats, wildlife disease, and the white-nose syndrome fungus will present the latest research and information on how to contain the spread, determine the cause, and attempt to find a cure for white-nose syndrome. State, federal and tribal land managers will discuss the national response to white-nose syndrome and implementation teams will formalize work plans as part of a more detailed implementation strategy. To date, Interior Department agencies have invested more than $10.8 million in this effort. This includes more than $3 million in research funding that is supporting ongoing research projects looking for methods to control or cure the disease. Ecologists and natural resource managers are concerned because of the critical role that bats play in maintaining healthy ecosystems and in agricultural systems. A recent analysis published in “Science” magazine’s Policy Forum showed that pest-control services provided by insect-eating bats save the U.S. agricultural industry at least $3 billion a year.